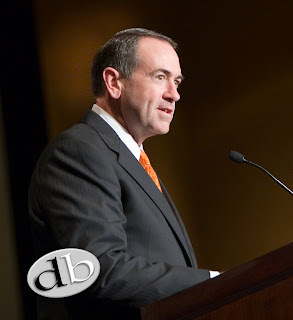 Last September, I received a letter from my old alma mater informing me that former Arkansas Governor, Mike Huckabee, would be the keynote speaker for their annual fund raising dinner. 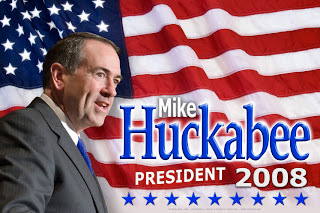 I had been hearing a fair amount about his presidential bid and thought him to be a very interesting candidate. In fact, I liked him a lot and was hoping he could start getting more media exposure. But, at this point, he was still a 2nd tier candidate, and very few had heard of him. However, thinking this might be a great opportunity to hear the Governor speak AND get some good photos, I immediately offered my services as a professional photographer to the school. And to my great delight, they accepted my offer. 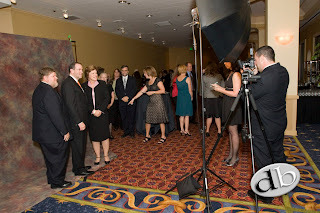 As it turned out, I was assigned to photograph the VIP reception, then was to continue photographing the evening’s events up to and through the Governor's address after the dinner. Well, VIP photos are as VIP photos go. You pose the VIPs, tell them to smile and grab the shot. And then do it again as long as your time lasts. It's pretty boring, but that's how it goes. 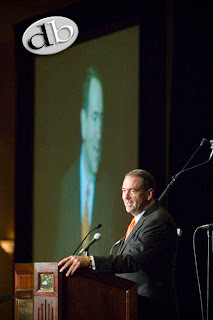 However, in-between the shots, I could tell that Governor Huckabee was a very gracious and genuinely affable man. 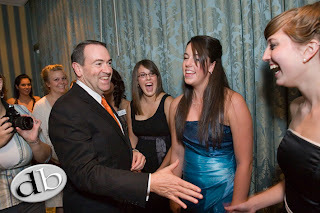 It didn’t seem like he was “tolerating” the moment, but genuinely enjoyed greeting the guests. This seemed especially true when he was talking with the young undergrads in the university’s choir who were also at the VIP reception. 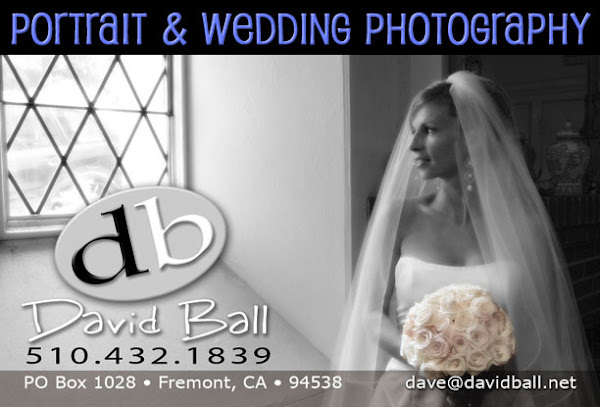 Since – as in most situations like this – I felt it was my duty as an event photographer to simply take the photos and try to stay in the background, I went about doing my job as quickly and efficiently as possible. Thus I didn’t plan to “chat it up” with the Governor since I was working the evening in a professional capacity. Now this was not one of the more brilliant of opening lines offered to the man you would like to see as your next president, but as I was unprepared to make any conversation, it was pretty much the only thing that came to my mind on the spur of the moment. You don't want to kid a photographer about a dream job like that. But I'm sure the poor man was put on the spot just as much as I was. In any case, we ran to our next stop for the evening and the Governor was just as affable with the other folks in the general photo session which followed. I didn’t have an opportunity to talk with the Governor any further, but listened as intently as I could during his address later that evening. Unfortunately, I was quite preoccupied with working the room for the best photo locations, so I kind of dipped in and out with my attention. But he gave a very impressive message regarding the young Christian students of my alma mater being the exact type of young leaders we need if our country is to have a brighter future. Which might seem more like the banal platitudes one would expect when a politician is addressing a room full of university alums. However, as I have previously demonstrated by my lack of quick thinking on my feet during my brief introduction to the Governor, I am likewise not doing his message justice as I describe it here since I am unable able to adequately recount the effect of the Governor’s presence and message as he delivered it with his southern humor and gracious style. Nonetheless, his audience obviously “got it” when they gave him a standing ovation as he hurriedly exited the room to catch a flight to his next campaign obligation. After returning home and processing the photos, I felt it might be appropriate (considering our brief meeting) to send the Governor a little gift album of some of the photos from that night along with a note expressing that it would be my great pleasure to offer my professional services as a photographer to his campaign should he have any upcoming events in our state. I also assumed that my gift might be brought to the Governor’s attention by a staffer, but that it probably wouldn’t go any further than that. 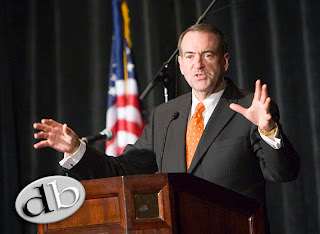 So, all this to say, I thought if I was really lucky (if the Huckabee campaign lasts as long as our state's primaries), perhaps I might get a call from a staffer saying I could tag along with my camera during a California stop . So what comes to my mail box a few weeks later??? To my great surprise nothing less than a very gracious, self effacing, hand signed, personal note from the Governor thanking me for my gift album along with high praise regarding my work and a final note that my contact information has been forwarded to his press secretary for future reference. Well, it’s a long way from being offered a position as a photographer on the White House staff, but I was still very impressed that the Governor would take a moment from his busy campaign schedule to bother sending me a personal note. Besides that, the California primaries aren’t until February 5th which – politically speaking – is a hundred years from now. He needs to focus on Iowa, New Hampshire and the early primary states. However, come January and February, you can bet that I will be answering my phone on the first ring. 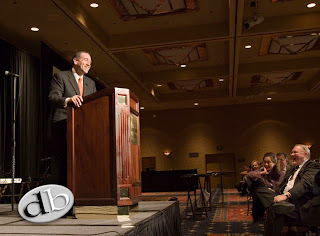 In any case, as I’ve been following the Governor’s campaign more closely since my experience with him, I’ve noticed many other written reports and blogs with the same kinds of personal warmth and charm by others who have only met him once … as well as others who have known him for years. Perhaps what I like most of all is that the Governor carries his power lightly. He comes off as a strong man with firm opinions and well thought out positions, yet he delivers his message in a soft spoken, Southern way that is not abrasive. He really seems like the kind of candidate who can collect a lot of Reagan Democrat crossover votes. And if he wins Iowa (as the polls suggest) and does well in New Hampshire, Florida and South Carolina ... who knows. 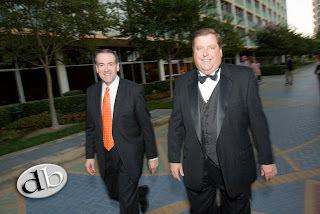 We might be seeing a President Huckabee sworn in on January 20, 2009. In any case, I got some great photos, got to hear the Governor in person, got to see some old college friends I hadn't seen in 25 years and - who knows - might have gotten a contact for a future job offer. What a great story! I found you via Huck's Army's forum for making your own campaign signs. Thank you for providing these pictures for us. Congratulations on this rare opportunity...and yes, dare to dream - that's where the future begins.